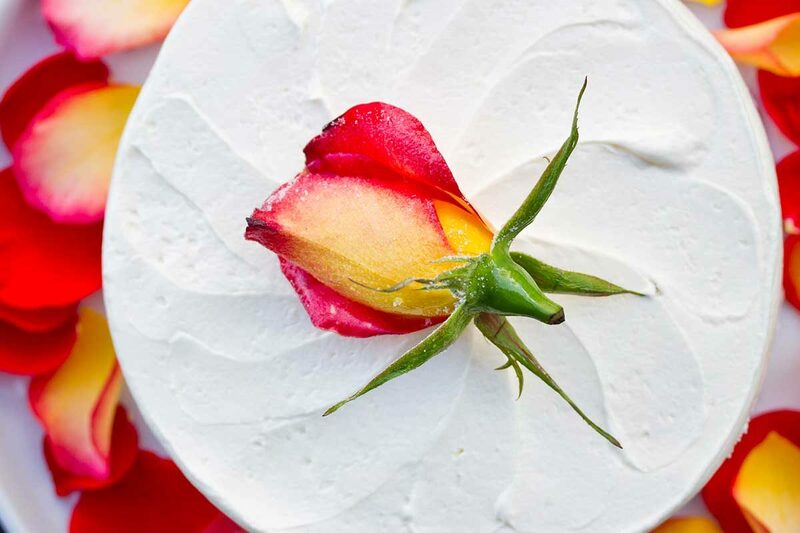 Flowers add bright color to desserts, cakes, and other plates. For dishes where a little extra sweetness would be welcome, a great trick to increase their visual appeal is to candy them (candied flowers are also known as sugar glazed flowers or sometimes “crystallized flowers”). To candy flowers you will need edible flowers, egg whites, a pastry brush and granulated sugar. Flowers: Be sure to use only edible flowers for this technique (we’re using edible orchids here). Not all flower varieties are naturally safe for human consumption, and many flowers sold in shops have been sprayed with chemicals that aren’t safe to eat. We’ve found sturdier flowers like orchids, edible roses, garlic blossoms, and edible rose petals are easier to candy then varieties with thin, very soft petals. Pansies and borage blossoms can work well, but take more practice. Note: Even when candied, edible roses & petals are more for decoration than consumption. Sugar: Though you could use conventional sugar, we highly recommend superfine sugar for candying flowers as the tiny crystals give better coverage and shine. Egg Whites: For extra safety (and convenience) we recommend using pasteurized egg whites (usually sold in cartons). If your egg whites are super fresh, and the egg whites are too thick to brush on, it may help to lightly beat them (not so vigorously that you begin to see bubbles) and/or add a little water to loosen them up. Either dip the flowers in the egg white (this works better with large petals than whole flowers) or brush the egg whites onto the flowers using a pastry brush. Dip the flowers in sugar or sprinkle sugar over the top (sprinkling takes more time, but usually gives better results). Shake off the excess. Let the flowers dry on parchment paper on the counter for 1-3 days (how long it takes can vary depending on ambient humidity). Store in an airtight container. How long candied flowers last can vary depending on the variety used, your local climate, and how thorough your egg-white coating is. Under ideal conditions they can last several months. Use your candied flowers to decorate cakes, cupcakes, top ice cream and custards, or as a plate garnish for almost any sweet treat.